Auto Mouse Click, Dragging, Double Clicks combined with auto key pressing on keyboard can automate almost anything on a Windows Computer. Whether you are using a 32 bit version of a 64 bit version of Windows 8, Windows 7, Vista, XP or any other Windows Operating System, the software applications presented here can be really useful when you want your mouse cursor to do works automatically on it’s own. 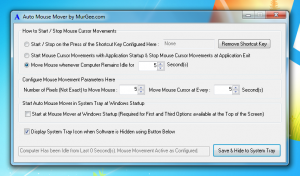 Auto Mouse Mover : This is just a small software application that can initiate auto mouse movements. The Automatic Mouse Movements can keep a Windows Computer from being inactive even when you are not actually using it. What’s the benefit of having the mouse move automatically ? The first benefit of having auto mouse movements is that while you are actually working & using your keyboard or mouse, the software will not do anything with the mouse cursor. When you are not interacting with your windows computer, the software will initiate auto mouse movements so that the windows computer will still remain active. On an active windows computer, the screensaver does not gets automatically launched, an active computer does not gets locked automatically, etc. Click on the screen below to see actual size screenshot of this Mouse Automation Software. Auto Mouse Clicker : This is a full professional grade Windows Automation Software by allowing you to simulate Auto Mouse Movements, Auto Mouse Clicks, Automatic Mouse Dragging and Dropping, Auto Keyboard Typing, and lots of more Windows Automation facilities built in. You can use this automation software to create automation scripts (in the form of .mcs files) which can store every type of automation action in it. Double Click on the .mcs file (The Automation Script) would execute the stored mouse, keyboard and other windows actions. Click on the above screenshot to view a few features supported by the software. There are lots of ways in which the Auto Mouse & Keyboard Actions stored in the automation script file can be executed. Given below are few of the features supported by this Automation Software or better download it on your Windows computer and give it a try yourself. There are lots of example scripts in the software which allow you to execute the functionality provided by auto mouse and keyboard software. Add Mouse Clicks of every type (Single Mouse Click, Double Mouse Click, Left Click, Right Click) to the Script. Add Mouse Dragging and Dropping Action into the Automation Script. Mouse Clicks can be either Fixed Type (Screen Co-Ordinates are stored in the Script), Random (The Mouse Click is initiated by selecting a random location on the computer screen) or Relative to the Last Click Co-Ordinates. For Fixed Clicks, automatic window screenshots are captured and displayed in the Preview Window allowing you to remember and recall a fixed mouse click’s location. For every click, you can add a comment to remember what a specific click is about or you can even tell the software to automatically read the window text and store it as comment. The Mouse Clicks Added to the Script can be disabled. Disabled Mouse Clicks do not click but only locate the mouse cursor to the specified position. This can be helpful when you want to run the mouse automation script in debug mode or you just want to see where the mouse will click once enabled in the script. Editing of Mouse Actions can be done using the inbuilt editor. Double click on the Mouse Script record would open up the auto mouse action in editing mode. You can copy the selected record(s) to Clipboard and then paste the records to any other automation script. You can also paste the copied record(s) to a text editor. 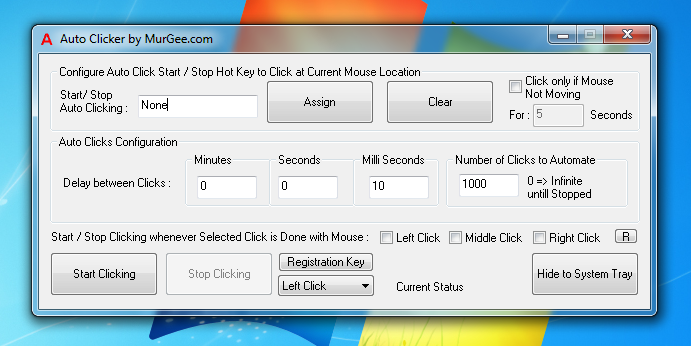 Every Mouse Click / Dragging can configurable parameters like fixed / random time delay before doing the click, repeat count deciding how many times you want a specific mouse click to be repeated, whether to move the cursor back to it’s original location on the screen, a comment to remember information about that click and you can even let the software populate the comment field with Window Title. Add Auto Text feature into the Script to provide input to the computer using Keyboard. Fixed Mouse Clicks are bound by Display Resolution, whereas most of the time Keyboard Input would remain the same irrespective of display resolution. Add Single Key to automate multiple times or any text to the script in the form of Auto Text to the script and the Auto Mouse Software would simulate the text onto the keyboard as if a human is doing the typing onto the keyboard. Read Text from a .txt file and type the text onto keyboard. Add Voice Commands to the Script using Text to Voice command. The Voice of the Text spoken by the script is configurable from the Speech section of Control Panel. Launch Application, Open Existing Document or issue a Print Command automatically. Open up a Web page single or multiple times with configurable delay in between. Add a Message Box to the Script with configurable text to display while executing the Automation Script. Activate an application window, close any open application, minimize or maximize application windows with this automation software. Click on the Screen by searching for a specific colour on the screen in a configurable rectangular area. Capture single or multiple screenshot(s) of the desktop automatically with this automation software. Launch the Automation Script with Configurable Keyboard Shortcut, Schedule it or Double Click on the .mcs file to start all the auto mouse, keyboard and other actions stored using this automation software. Auto Clicker : This Auto Mouse Software is specifically for Clicking Mouse. 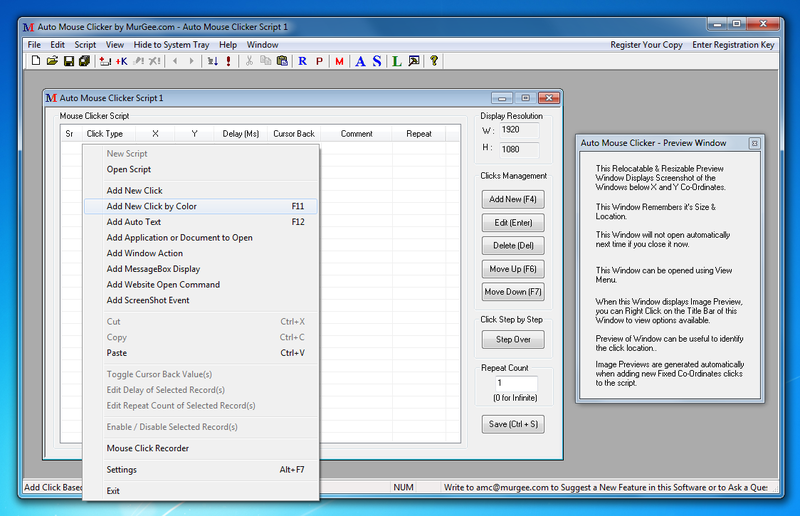 Left, Right and Middle Mouse Clicks can be automated with this Mouse Automation Software. Configurable Number of Clicks, configurable delay between the click, and configurable idle duration makes this auto mouse software really useful. Start and Stop the Mouse Clicks with a Keyboard Shortcut, on the click of a button or configure to start / stop the clicking with actual physical mouse click. 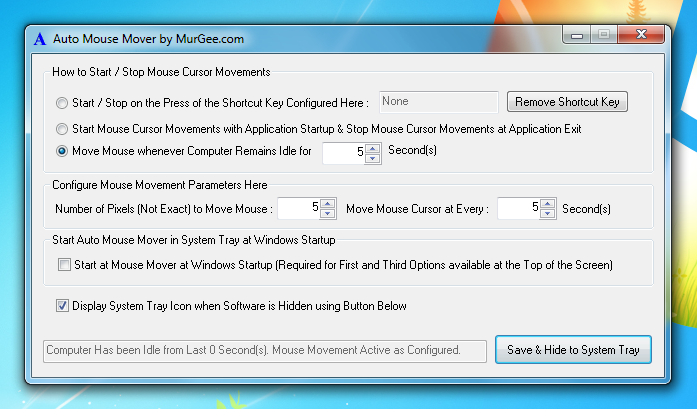 This Auto Mouse Software can be really useful when you have to do lots of clicking, like in a game or something else. 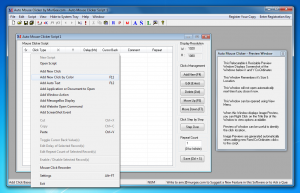 There are many more Mouse and Keyboard Automation Software Utilities at MurGee.com. All the Automation Software applications do work fine with Windows 8, Windows 7 and other version of Microsoft Windows Operating Systems. In case you do not find an automation software for your need, you can simply drop an email to support@murgee.com and get the automation software created exactly as per your requirements. Once the installation of the software completes, an appropriate tutorial page is opened up automatically in the default browser.